****If you are looking for LLR-inspired hair ties, please message me for details. Choose your desired amount from the drop down menu. 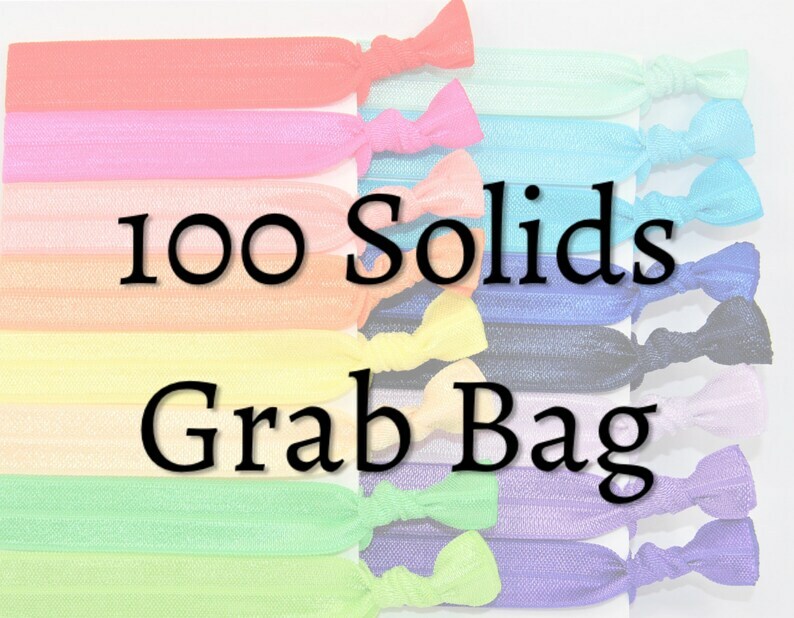 If you need more than 1,000 hair ties, please message me! We have many colors of solid hair ties! We also have solid white, black, grey, brown, and several other shades, which could be included in your grab bag. If you have a preference of colors, please let me know! I will do my best to get you the colors you need. MissPonytail hair ties are the perfect addition to your hair accessories! They even double as a bracelet! Perfect gift idea. Perfect end of season gift for sports teams/cheer squads! Hair Tie Favors are such a fun addition to any party! They work for all hair types! Each set of 100 comes packaged in 2 cellophane or organza bags of 50 without cardstock display cards.